They say one picture is worth a thousand words. 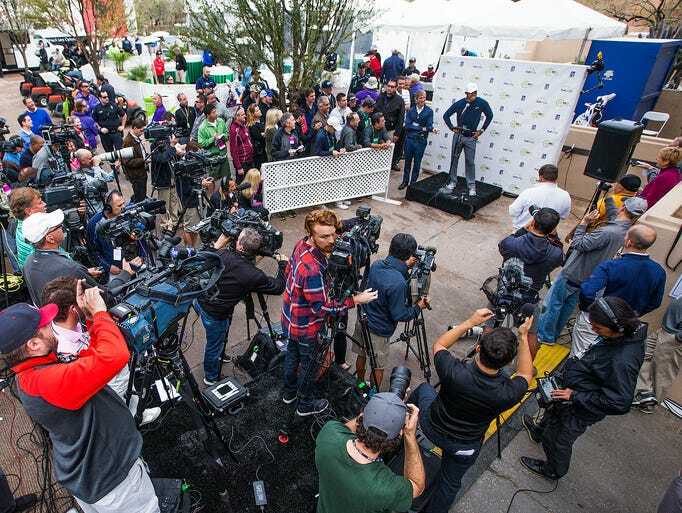 Just look at this picture of Tiger during his press conference Tuesday, courtesy of azcentral.com. When do you last remember seeing Tiger smiling and talking with his hands this much? You may not know that his press conference was televised live by both GC and ESPN. (ESPN is broadcasting many of their shows live from Glendale, near Phoenix, this week because of the Super Bowl.) While GC had Tim Rosaforte on set to comment, ESPN had Dottie Pepper... and Dottie was clearly excited to see Tiger so relaxed. She commented on the fact that he was not only smiling and laughing, but also handling questions that he wouldn't have dealt with in the past. If you missed the presser, you missed an unusually cheerful and talkative Tiger. He handled questions about almost everything under the sun, including having the flu for 3 weeks after the Hero World Challenge, his long absence from Phoenix due to security concerns, the condition of the newly-remodeled course, the "Great Tooth Incident" -- which, btw, Dottie says several dentists told her that Tiger's version of what happened is entirely plausible regardless of what you've read on the internet -- and his chipping problems. The upshot of it all is this: Tiger Woods appears to be at a very good place in his life, a place where he even feels comfortable relaxing in front of the media. And if that carries over onto the golf course, we're all in for a really good year of golf. Of course, we may not be able to say the same for his competitors.